Range trading is one of the most basic trading methods in forex. It complements other strategies such as trend following and breakout trading but many use it successfully on its own. It is not difficult to spot a range in a price chart. In most financial charts, there are obvious areas where the price seems to follow what looks like a predictable path. These are ranges, and they come in a whole variety of varieties. Traders like ranges because they do one thing: reduce uncertainty. This article covers the most common types of ranges in forex markets and how to trade them. Ranges form where the price is constrained between a support area and a resistance area. The basic way to trade ranges is to enter (or exit) near to the range boundaries. That means selling when the price is at the top of the range and buying when it is at the bottom. The top of the range provides a resistance area to price rises and the bottom a support area for price falls. Figure 1 below shows an example of a rectangular range or box channel in which the price moves within a pair of parallel lines. As with all trading systems, success lies in attention to detail and correct execution of the technique. Figure 2 below shows an example of a rectangular range. The bottom indicator in Figure 2 is the MACD indicator. The MACD histogram line (shown in black) crossing downwards through the signal line (orange) indicates a sell signal. An upward crossing through the signal line indicates a buy. The height of the MACD line indicates the level to which the price is overbought or oversold. Indicators like MACD are useful if you are using automation. The ATR (average true range), RSI and standard moving averages are also helpful. There are also some specialized tools available for automated trading. 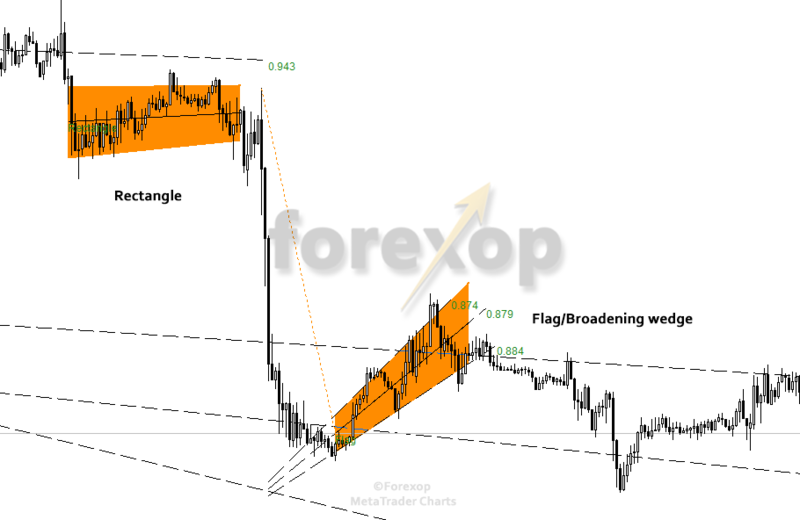 Price channels are another common chart pattern in forex. These are simply diagonal ranges. 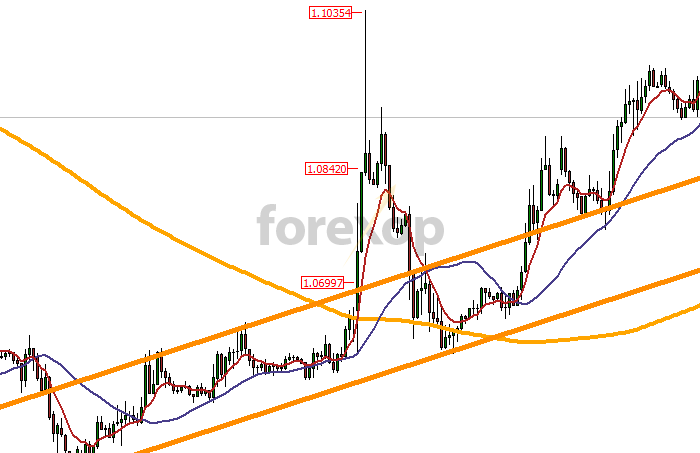 In this kind of range, the price ascends or descends within a sloping trend channel. The channel can be a rectangular. But it can also be narrowing or broadening. Channels can extend over very long periods, sometimes years. These are of course trends but in reality, most of the short duration trading opportunities will happen within the ranges that develop within the trend. For this reason channels can be traded with a trend following strategy or a breakout strategy. When short duration channels form against the main trend, these are often continuation patterns. These include wedges, flags, and pennants (see below). With channel ranges especially the shorter duration ones, breakouts tend to happen in the opposite direction. In an upward sloping range, the most likely break is to the downside. In a downward sloping range, the most likely break is on the upside. This is not a cast iron guarantee by any means, but it is a useful rule of thumb in technical analysis. Figure 6 below illustrates this. A downside break happens, in a bearish rising wedge. This gives back nearly all of the gains that the upward trend made. Figure 4 shows a longer bearish channel. Here the range sees a strong upside breakout. These examples demonstrate how the price often “pulls back”. False breaks can happen from a variety of triggers inlcuding news releases. These are sometimes a result of program trades when automated systems enter on the first response to a data release. Often though, the market has already absorbed the news prior to the release so the move “fades” as the consensus view of the market re-establishes itself. The price then reverts to its original track. Figure 5 shows an example of a breakout of a channel in the direction of the range itself. This happened during an announcement by the US Federal Reserve. The price does fall back within the range shortly after making a break of some 300 pips upwards. For the reasons above, depending on the range slope and the currency pair, some traders prefer to trade one direction or another, rather than trading both ways. Continuation ranges are chart patterns that occur within trends. These include pennants, flags, wedges and triangles. These kinds of ranges usually mark a correction against the predominant trend. They can be either bullish or bearish signals. These patterns can occur at virtually any timescale. They can be traded as ranges in their own right, or as breakouts – depending on your trading time horizon. These patterns can produce strong bullish or bearish breakouts when the prevailing trend resumes, so many prefer to trade them as breakouts rather than ranges. With most ranges, the pattern is not obvious on first sight. In such formations, the price movements take place around an central pivot line with support and resistance areas forming around it. Tools such as trend line analyzers and moving averages are useful in marking out these ranges and identifying where the support and resistance areas are. Some traders prefer to trade these kinds of ranges towards the central pivot axis rather than at the extremes. In this way, they aim to trade out extremes of price on the assumption that it will revert to a mean (the central pivot axis). For more on this technique see this article on pivot trading. With this strategy, you use a smaller profit target and seek to capture the price movements as the price pushes towards the central axis of the range. As mentioned above once the price hits the range wall, the chance of breakout (or partial which hits a stop loss) is always there. Therefore, by trading at the edges of the range the trader is relying on the price turning successfully in their favor. By trading the central area, you can reduce the risks of turns at the edges of the range. In most situations, the price movements in a range deviate around a center line. Setting your entry and profit target away from the extremities improves the chance of reaching your profit target. It also increases the number of tradable opportunities that you will have. The downside though is that it will reduce your potential profits on each trade. Wait for the price to reverse at the boundary or at about 2/3ds from the boundary of the wall. You will usually see consolidation around these levels before a reversal takes place. Confirm the move with at least two candles that mark the direction away from the boundary and towards the center of the range. The price often turns before the support/resistance so set the take profit (TP) level no more than 2/3rds of span of the range. Set the stop loss well clear of the range boundary to allow for failed breaks. The ATR signal is useful in deciding a stop loss, as are support and resistance zones (as well as those at higher timescales). Beware of setups that look “too obvious”. If something looks too good to be true it probably is; if the range looks like a sure thing it could be due a breakout at any moment. Range breakouts are rarely clean and decisive. This is a reality that will complicate any breakout or range trading strategy. Failed breakouts mean the price will often break then descend back into the range. There are indicators available for handling and detecting range breakouts. When trading the range, we try not to “chase the price” on a breakout. Range breakouts can be strong and will take profits along with them. If you are caught the wrong side of the move, it is best to cut the loss and wait for another entry opportunity. Likewise, it is best not to try to trade back towards the range after a breakout. With well-established ranges, several retests of the boundary are common before a full breakout. Use the retest as an exit opportunity. For this reason, we avoid the trade when a break looks possible even if the price moves firmly back inside the range. This margin of error means giving up some profit, but it leads to fewer loss trades. This part seems unclear to me. Are you saying that once a breakout is attempted and fails, it’s best to exit the trade? I would but that’s a personal choice and a decision for the strategy you are using. Breakouts often take a few attempts. Catching the wrong side of one isn’t worth the risk when the upside is small. Yes exactly. This means where the trade looks like a given in reality probably the opposite is true. With ranges they do look obvious after the event once the move has already take place. For example you can get a breakout on a lower range, but in fact it is just a continuation of a range the next level (or two up). When entering the trade think about the other side. By that I mean who is there to take the other side of this trade, if the answer is “no one” take a breather before diving in – or consider going the other way.